Yesterday morning, at around 5:50 a.m. a shocking incident has happen, involving a woman who committed suicide inside LRT-1 Epifanio delos Santos Avenue (EDSA) station. Seconds before the train stop by on the station, the woman suddenly jump in front of it and died. According to LRTA spokesman, the woman who have committed suicide jumps off the platform track after a roving guard walked by her. 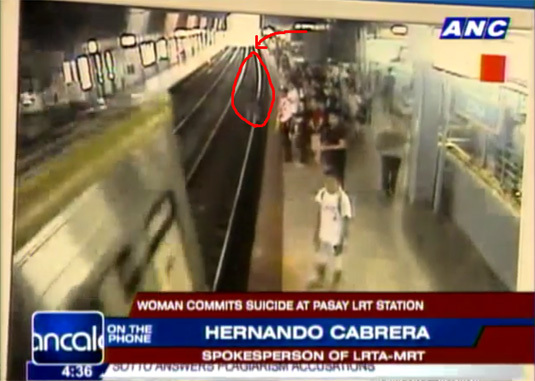 LRTA spokes person, Hernando Cabrera said in his Twitter account, "cctv shows the woman jumped into the tracks right after the platform guard walked by her." Cabrera also said that this suicide incident is 10th since the LRT-1 started operations 28 years ago. He said, "From 1984 to present (at the) LRT-1, a total of 24 suicide incidents (were recorded), 10 of them fatal. (The 24 included) 19 female and five male." The said suicide is seen and covered by the station's closed-circuit television (CCTV) camera, the incident happened just in seconds. I don't have yet any copy of the CCTV footage, but as soon as a copy is posted in YouTube, I'll share it here for everyone to see how the woman jumps in front of an incoming train. The woman is now identified. For the meantime, stick to the image above, you may also share this breaking news to your friends on Facebook, feed it on your Twitter account and in your Google+. Comments or suggestions about "Woman commits suicide in LRT-1 Edsa Station" is important to us, you may share it by using the comment box below.